Our assignment was to create something using switches. My goal was to use 3 switches and a 3 color LED to make a circuit that can produce any color. I am using my Arduino to power the board. Each button can be on or off, so this can produce 8 different colors. In the picture below I am activating the blue and red colors, making magenta. For our first class, we were introduced to the Rhino modeling program. Our assignment was to build something that fits in a 3 inch cube using the commands we learned about in the lecture. My goal was to make a standard rook chess piece. To begin, I created a new workspace with millimeter settings (as instructed by Xuedi) and turned on the grid snap. 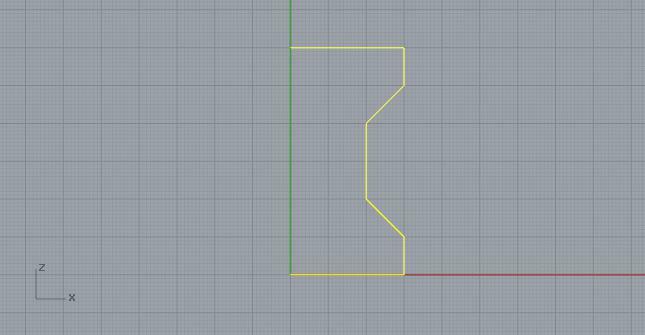 Using the Polyline command, I drew a rough outline of the contour. My intention was to later use the Revolve command. Introduction to 3D Printing, taught by Xuedi Chen. Our first assignment is to choose a design we like and analyze its adherence to the principles of design. We needed to look at the grid system, color system, and the fonts. 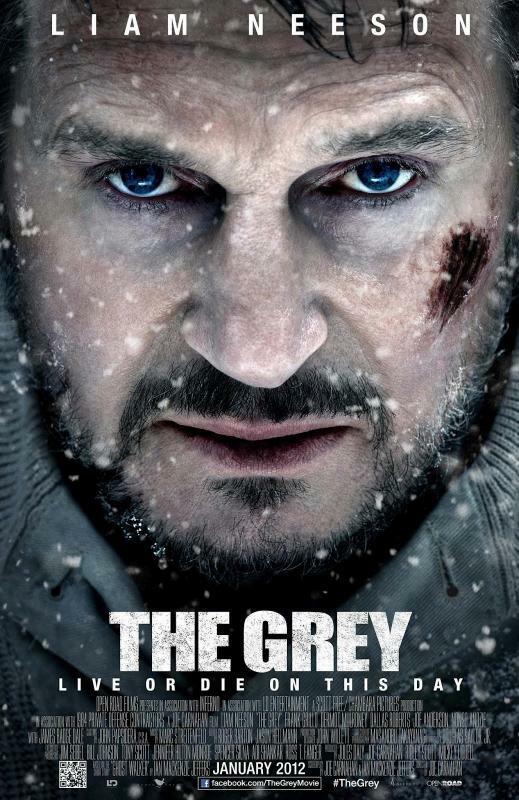 I picked the movie poster for the movie The Grey. I find the imagery to be visually striking in a way that is consistent with Liam Neeson's character in this movie. The most primary feature of this poster are Neeson's eyes. His eyes are the most noticeable and are the only blue thing illustrated on the poster. After his eyes, the prominent features are the movie's title and the redness of his mouth and the cut on his face. Visual Language, taught by Katherine Dillon. A Soundwalk is a directed walk with a focus on listening to sounds instead of viewing sights. I went on The Gaits Soundwalk, a soundwalk commissioned by the High Line park in NYC. This is an above-ground park built on raised railway tracks abandoned years ago. The Gaits Soundwalk is experienced with a phone app that only functions when the user's phone is actually on the High Line. I actually thought the app was broken when I arrived at the beginning of the High Line on Gansevoort St. It began making bell noises when I started to ascend the stairs. For the first five minutes or so the Soundwalk consisted of only intermittent bell noises that would slow down or stop when I stopped walking. As I moved along, the walk got more interesting. The bells sped up, and then an organ was added. I heard water churning at several locations, and while at sections of the walk with seating for viewing parades or other city activity, I heard applause. There were also birds chirping in the section of the walk with a lot of trees. Unfortunately there was construction and scaffolding covering everything so there were no actual birds to be seen. Still, I do appreciate the synchronicity to the environment. In Chris Crawford’s book, The Art of Interactive Design, Crawford defines interactivity in terms of a conversation. Specifically, interactivity is a cyclical process of two actors taking turns listening, thinking, and speaking. Unfortunately, the word "Interactive" is often explained or defined poorly, and as a result is poorly understood by our culture. The term gets added to products as a buzzword to make them sound better, but often the objects don’t really "interact" in a way as described by Crawford’s definition. There is no "conversation" or cyclical process. A literal conversation between two people fits this definition literally, but when the interaction is between a human and an electronic device, the steps become input, process, and output. Key point though is that there are two actors, not one. Each actor is some kind of "purposeful creature," so a wall or a rug cannot be interactive. It isn’t always clear if something is interactive or not. Rather than being a boolean thing, there are different degrees of interactivity. We can evaluate high or low levels of interactivity by evaluating the quality of the listening, thinking, and speaking steps. Excelling in one area does not compensate for failures in another. A common design error when building interactive products is to fail to appreciate this idea. Physical Computing, taught by Tom Igoe. Sunday, September 10, 2017 2:03 PM What is Interaction? Video & Sound, taught by Gabe Barcia-Colombo. My Networked Media class has come to a close. I enjoyed it very much am am grateful for the experience. Shawn van Every is a great professor who who taught us a lot about building websites with node.js and express. My final project is currently hosted on Digital Ocean and uses a new subdomain I created, apps.ixora.io. I intend to use this domain to permanently host this project and other projects I create in the future. My final project is a continuation of my midterm project. I achieved my goals of building an easy to use interface for qualitatively exploring the drawings. You can find it here: http://apps.ixora.io/drawings. The source code is available on github. I put a lot of work into organizing the code in a way that scaled and matched the best practices of node developers. There are still some issues in that area and I will continue to improve it so my next project will have less frustrations. I am also going to work on the front-end to learn more about css and user interface design. There's still more to learn about these pictures. The most exciting thing about it is that there are so many more hidden gems to discover in this dataset. I'd like to use data science techniques to explore the similarities and differences between countries. Allison Parrish told me about some work done by other researchers on this dataset that I will learn from and build off of. They seem to involve tensorflow which I've been wanting to learn about anyway. I have time to devote to this between now and the fall semester. And finally, my favorite drawing. I may use this as my Facebook profile picture.